To make redactions or highlights on an imaged document, click the document you would like to make changes to. Then click on the Image Markup viewer tool icon at the top right of the Document Viewer. Highlight: Page through an entire document to add a highlight box, an optional corresponding issue, and/or a note. To add more than one highlight to a page, simply click "Add Another Highlight". Redact: To start redacting a document, simply toggle to Redact mode and add your redaction reason, style, and (optional) note. Once you've highlighted or redacted your document, you can see all highlights and redactions for that particular document listed by corresponding page in the "Image Markups & Page Notes" section of the sidebar. If you need to view a version of your document without image markups, click the Toggle Markups viewer tool icon at the top right of the Document Viewer. There are several ways to export image markups in both Review and Prep. In Review, select the REVIEW tab and click the menu. 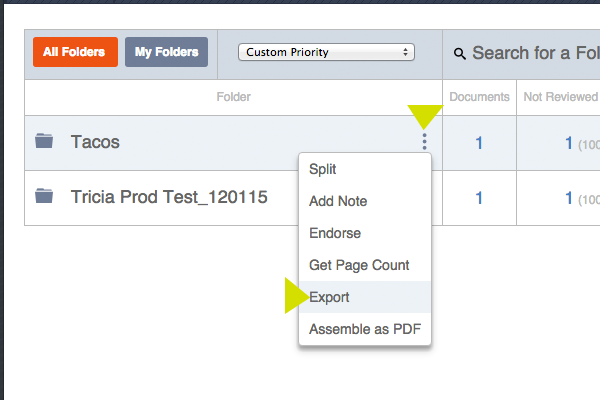 Click "Assemble as PDF" and choose to include highlights, redaction notes or page notes. Nextpoint will notify you once the PDF is assembled and ready for download. In Prep, select the DOCUMENTS tab and click the menu. Click "Assemble as PDF" and choose to include highlights, redaction notes or page notes. Nextpoint will notify you once the PDF is assembled and ready for download. In either Review or Prep, click into an individual document and open the Document options dropdown. Select "Export Family" to export a document's family to a PDF with the option to include any image markups and page notes. Once you have finished making your selections, click "Export" and your PDF will begin downloading. Select "Generate PDF" and select any image markups or page notes that you would like included in the PDF. Then, click the "Generate PDF" button and your PDF will begin downloading. Load file templates are only created as part of the export template process and define which fields are exported and how they are arranged. Once created, the same load file template may be referenced by multiple export templates. When you click "Create New" in Step 4 of the export template process, you will be prompted to name your new load file template and select the fields that will be included in the export. Once your load file and export template are completed, select a folder and choose "Export" from the drop-down menu. 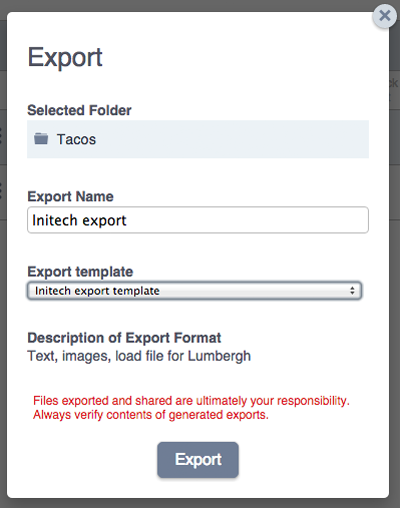 Name your export, choose an appropriate export template and proceed. ZIP archives will be generated and Nextpoint will notify you when they are ready for download. Once a redaction markup has been applied, anytime that document is exported, the redaction will be in place on the image and the underlying redacted search text redacted from any provided text files. If you are providing a metadata load file with your export, it is recommended you review your export closely for any redacted fields such as author, recipient, email subject, etc.. If those fields have been redacted on the images/text, they will need to be manually removed from your metadata load file. On the other hand, if highlight markups are made on an image, they WILL NOT be exported on your images unless explicitly selected during the export process as outlined above.